Hugo thinking to himself: "This is what I get for being a drag queen first and now this Elf Lord with long hair! What is with the the braids, I look like a really weird Pippy Longstockings? Elves should have thought of feathers and jewels." 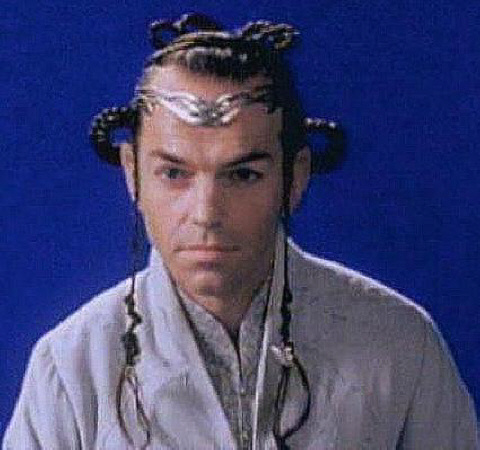 Elrond vows never to visit the Elves Hairdresser Guild again. Elrond awakes from a nap while babysitting a young Arwen. Help me, Obi-Wan Kenobi! You're my only hope! Introducing the Poster for the new movie "The Queen of the Rings~The Fellowship of Priscilla and the Desert." "Hey Peter am I supposed to be playing Elrond or Princess Leia?!" "Are you laughing at MY hair, Mr. Anderson?" (Thinking:) Wait a minute! Am I playing Elrond or Mitzi today? I am so confused! (Thinking): How will I ever get to sleep tonight on this 'do'?